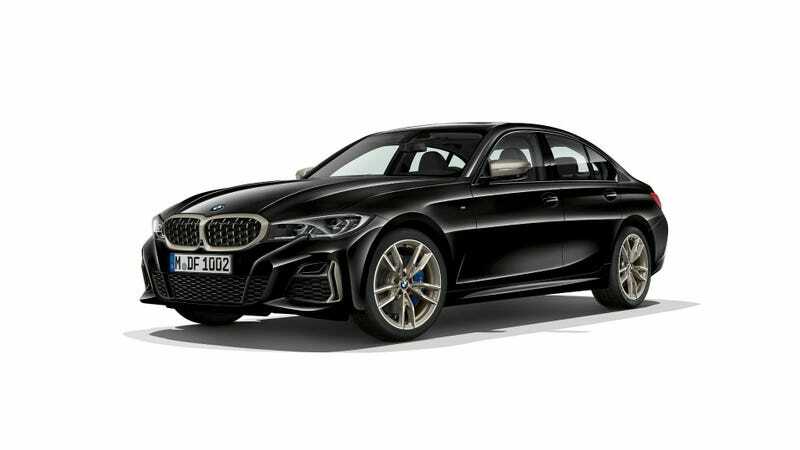 Just ahead of the upcoming LA Auto Show at the end of the month, BMW has revealed the 2020 BMW M340i and the all-wheel drive M340i xDrive. It’s now the fastest non-M3 production 3 Series, but unlike the current 340i, the new one devastatingly loses the 6-speed manual. Back when we reviewed the 6-speed manual 2016 340i, we said the manual was the best part. Now we’ll have to find something else to like about the new one, I guess. That car had 320 horsepower and 330 lb-ft of torque, but the new one has improved power specs in every way. Beyond adding a little M-badge before the name on the trunk now, the 2020 M340i jumps to 382 hp and 369 lb-ft of torque from a newly worked 3.0-liter turbo inline six-cylinder. The new car also brings down the weight by over 121 pounds thanks to some new aluminum parts in the hood, front fenders, and engine subframe, and the drag coefficient has been reduced by .03 Cd to 0.26. All that, coupled with more power set a zero to 60 mph time of 4.2 seconds. At least on the all-wheel xDrive car. The release lists “TBD” next to the rear-wheel drive model. The Adaptive M suspension is optional, and comes with electronically adjustable dampers and an M Sport suspension setup, which also lowers the car by about 0.4 inches and adds more wheel camber. The car can also decouple the powertrain for improved efficiency for “coasting” in Comfort or Eco mode, so that’s nice, I guess. The body structure and chassis of the car have also been reworked in an effort to improve stability and handling, and you can read a lot more about the engineering behind that here. The car also gets a M-Sport limited-slip diff, dual exhaust and an updated 8-speed automatic transmission standard. BMW claims the launch control system is improved, and the transmission can work with the data from the car’s navigation and the suite of active car control sensors to hold shifts in corners longer through fast corners or change down to help slow the car in traffic. While the 8-speed sounds more than capable and is likely quicker than my jelly hands attempting to keep up with it using a manual, it’s hard not to laugh when the release claims the “rear-wheel drive BMW M340i will offer the pure driving experience that 3 Series enthusiasts have enjoyed for the past 40 years” and doesn’t give me the option. Maybe there’s still hope with the new M3.